~ Cutting files for steel available. See our kits page. This design was drawn to satisfy the client who wants performance and luxury in a strikingly modern boat. It is available in two layout configurations, named the DIX 57 CHARTER and the DIX 57 CRUISEMASTER. Both versions have aft steering cockpits, where all sheet handling is also performed. Each also has a centre cockpit just aft of the main companionway, for relaxation out of the way of the workings of the ship. An optional fixed or folding dodger gives protection to the centre cockpit. The CHARTER has a walk-through linking the two cockpits while the CRUISEMASTER has a separating bridge-deck to give the necessary headroom full width across the master cabin below. The CHARTER has an integral arch over the centre cockpit, carrying the mainsheet and forming a support for a collapsible deck saloon. On the CRUISEMASTER the arch is right aft and carries the radar dome and other electronics. Both versions have a built in stern swim platform with full width seat. Both accommodation layouts are roomy and comfortable and worked around the raised galley, navigation and steering areas under the low profile pilothouse. The CHARTER has separate crew accommodation in the bows with private access to the interior. The saloon features a large dinette and two love seats for the comfort of guests. There are three private guest cabins, each with double berth and head with shower. The CRUISEMASTER has two forward double cabins which can have either double or upper and lower berths. The saloon features a large dinette and two easy chairs. The master cabin aft is large and includes settee, dresser and heads with bathtub. The cutter rig is large and powerful but, with modern sail furling equipment, can be handled by a small crew. Construction materials for which detailing is available are all steel, steel hull with alloy deck or all alloy. Displacement for all alloy construction is approximately 3000kg lighter than that for all steel. The hull shape is radiused chine, giving a round bilge hull shape which is easily formed without compound curve plating problems. 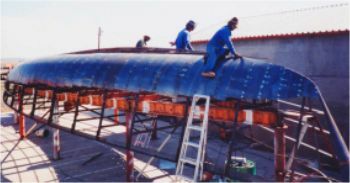 The shallow draft of 1,75m has been achieved by the use of a winged keel to maintain stability and upwind ability or an alternative fin keel of 2m draft can be used. In July 2011 we have added a bilge keel option. This has the same draft as the wing keel version but allows her to stand upright when out of the water or for bottom cleaning when cruising in far away places. Fuel tankage is in the keels and water tanks are in tghe hull. This is a design which catches the eye wherever she goes. She will carry her crew to whichever oceans of the world they may want and she will take them there quickly, safely and in comfort. For similar concepts in larger and smaller sizes, see the Vickers 45AC and Dix 65. 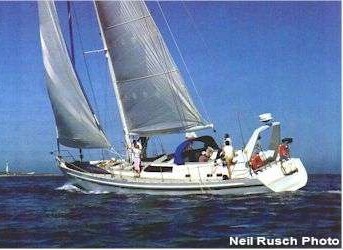 Willy Ritch-Smith & Maggie Gardiner - New owners of steel Dix 57 "Jeanne", now named "Arbella", had this to say about her. "We've owned the ex-Jeanne (now Arbella) for a year and are very happy. The boat performed very well during that time and we've comfortably cruised from Trinidad to the Med. I've found the drawback of having this boat is that so many people stop in the boatyard to compliment us on it that our work often slows dramatically. Vanity being what it is, it's a burden I'm willing to bear. "